The US and EU were initially cooperating in the effort to destroy the independence of Ukraine and make it a subservient entity to the EU government in Brussels. For the EU government, the goal is to expand the EU. For Washington the purposes are to make Ukraine available for looting by US banks and corporations and to bring Ukraine into NATO so that Washington can gain more military bases on Russia's frontier. There are three countries in the world that are in the way of Washington's hegemony over the world -- Russia, China, and Iran. Each of these countries is targeted by Washington for overthrow or for their sovereignty to be degraded by propaganda and US military bases that leave the countries vulnerable to attack, thus coercing them into accepting Washington's will. The response of the neoconservative, Victoria Nuland, appointed Assistant Secretary of State by the duplicitous Obama, was "f*ck the EU," as she proceeded to describe the members of the Ukraine government that Washington tended to impose on a people so unaware as to believe that they are achieving independence by rushing into Washington's arms. I once thought that no population could be as unaware as the US population. But I was wrong. Western Ukrainians are more unaware than Americans. The orchestration of the "crisis" in Ukraine is easy. The neoconservative Assistant Secretary of State Victoria Nuland told the National Press Club in Washington on December 13, 2013, that the US has "invested" $5 billion in agitation in Ukraine. 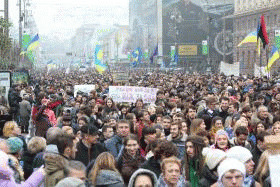 The crisis essentially resides in western Ukraine where romantic ideas about Russian oppression are strong and the population is less Russian than in the eastern Ukraine. The US- and EU-financed NGOs are fifth columns designed to destroy the independence of the countries in which they operate. Some pretend to be "human rights organizations." Others indoctrinate people under cover of "education programs" and "building democracy." Others, especially those run by the CIA, specialize in provocations such as "p*ssy Riot." Few if any of these NGOs are legitimate. But they are arrogant. The head of one of the NGOs announced prior to the Iranian elections in which Mousavi was Washington's and the CIA's candidate that the election would result in a Green Revolution. He knew this in advance, because he had helped to finance it with US taxpayer dollars. I wrote about it at the time. It can be found on my website, and in my just published book, How America Was Lost.